This is not some exotic water lily. What began as a ball of leaves dropped into the glass tea pot began its change as I poured boiling water over it. Suddenly, graceful petals unfurled and blushed, coloring the liquid amber gold. 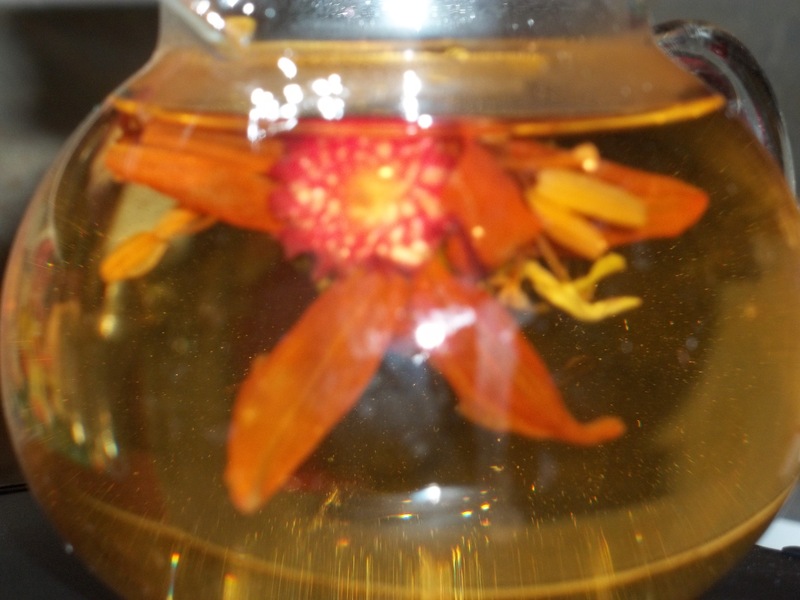 Named flowering tea, it shows me that what seems to be a dried up, useless thing can become beautiful and delicious. A gift of surprise! Do you like surprises? I hear people say that they don’t, but I think they are saying they don’t appreciate being startled unexpectedly. However, I believe it is just these unexpected, sometimes unwelcome moments that come into our lives that give us glimpses of Grace we would never otherwise experience. And that this is a life lesson in understanding that we who want so much to plan and project and barrel ahead on our own steam really do see only a part of the larger, eternal picture. This blurry photo is one of those that I am tempted to discard because it is less than I set out to accomplish, then allow it to draw me back for a “think about it” moment. 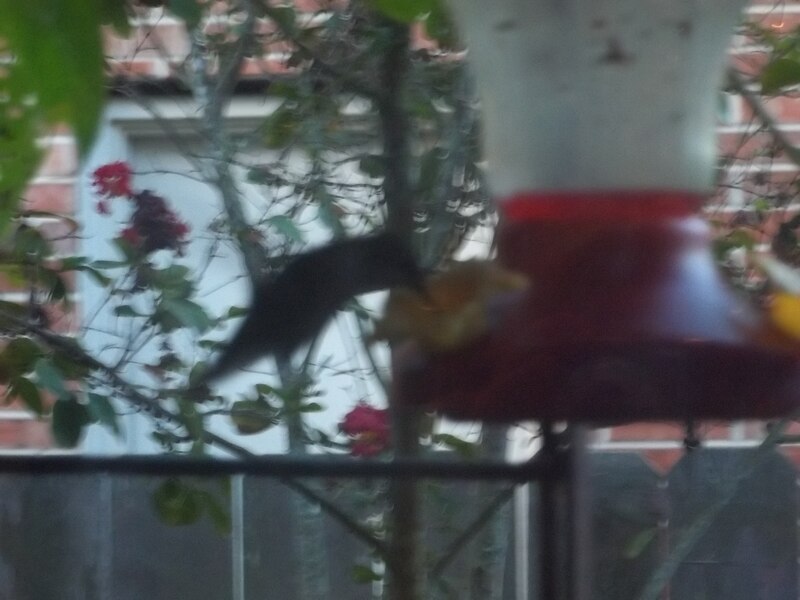 I captured the image standing at my kitchen sink, which produced mostly a silhouette of the busy little bird, wings frantically buzzing while snatching tiny tastes from the feeder. I watch for him, but I seldom glimpse his full glory even though I am inches away because he is on the move. A hummingbird garden is not a still garden. The arrival of hummingbirds at our feeders brings the scene alive with dashes of color as they whir and whirl about, darting in for a sip of nectar, wheeling out to sit momentarily on a twig, then barreling back full speed to catch another drop or two. It is in those moments of perching stillness that I find these tiny creatures giving me a deep life lesson. In all their quickness and industry, it is only as I catch the still seconds that I can see their feathers, really absorb the rich brilliance of their unique coloring. If there were no stops and stilling, however brief, how could they continue their pace, how would energy continue for gathering of nourishment? The above words quote an artist who uses birds, and hummingbirds in particular often in his work, which calls me to come home, and be still. Expecting dry wall and paint repair in several rooms of the house has made it necessary to clear off shelves to make it easier to move them. This reminds me I have too many books. I do have a stack sorted to donate to the library. Then there are those books I reach for and begin to smile, sit down, and start reading. Of course that doesn’t get the clearing and cleaning done, but how dear it is to have those old friends that beg to be enjoyed once more. A book I found today is in yet another category. It has been mine for many years, given to me by my mother who enjoyed it when she was a child. Its fabric cover is worn and stained. There are childish scribbles of names (Mother and her brothers) and notes, its binding is separated from the spine. Published in 1912, it is nearly 100 years old, so showing its age is not surprising. 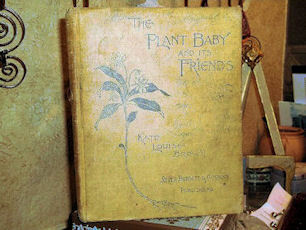 The Plant Baby and Its Friends,written by Kate Louise Brown, is subtitled A Nature Reader for Primary Grades. It always intrigues me with its line drawings, stories, and poems about plants and their parts. But I love the verse which begins its preface. Where’er our feet have trod. Thy glory veils our sight. Will guide the soul aright. This book will go back on the shelf. I think my granddaughters will enjoy it as much as they do pressing flowers and watching caterpillars on the parsley get ready to be butterflies. The words below are taped by the coffeepot where I can read them each morning. Just as when repeated in wedding vows, “I will” involves determination, but must be followed by trust that God will enable. For 40 years, in 10 different homes around the world, the resolutions remain changeless, the love of God unfailing. 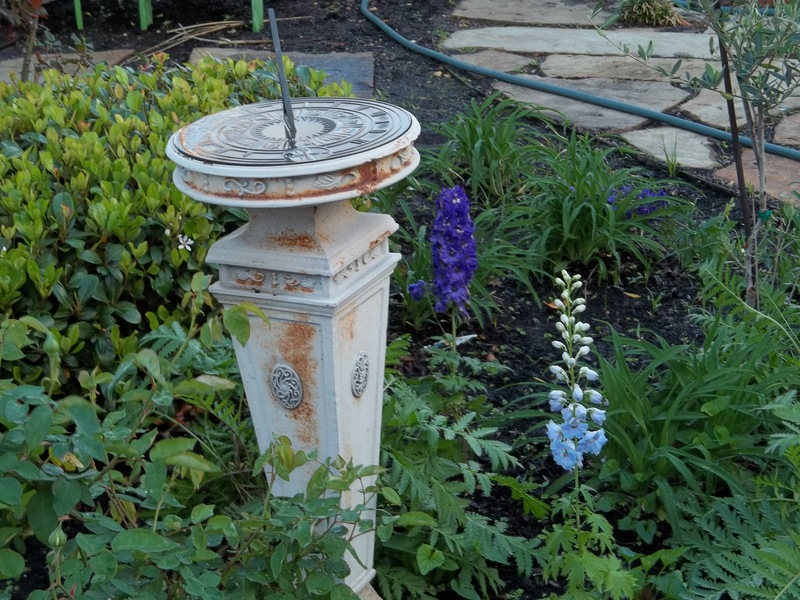 In my garden, this sundial is not only a visual reminder of the passing hours each day, but of time past, time present, time future. If I stand looking back too long I see only that which is no longer mine to use. If I look only forward, waiting for tomorrow, I fail to see that when it comes, it will be today. Standing in the present, I take joy in now. Where I stand really does change what I see and celebrate.